Neumann Brothers was hired to construct a new African Exhibit at the Blank Park Zoo. This design-assist project consisted of a black rhino exhibit including three outdoor public viewing exhibits, a new rhino containment building with hydraulic state of the art containment systems, indoor public viewing, and an appearance of their natural habitat in Africa. Neumann Brothers also built two Eland and Ostrich outdoor public viewing exhibits, an Eland and Ostrich containment building, and natural retaining walls and walking paths similar to a mud path in Africa. One additional item within the Africa exhibit is a bird aviary constructed of wood timbers, aviary containment, thatch roofing, and interactive theme work to enhance the viewer’s experience. Phase two of this project included the construction of the "Principal Pavilion". 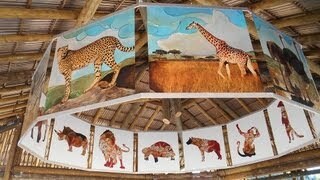 The pavilion is an educational viewing area that offers an unobstructed view of the giraffe exhibit.